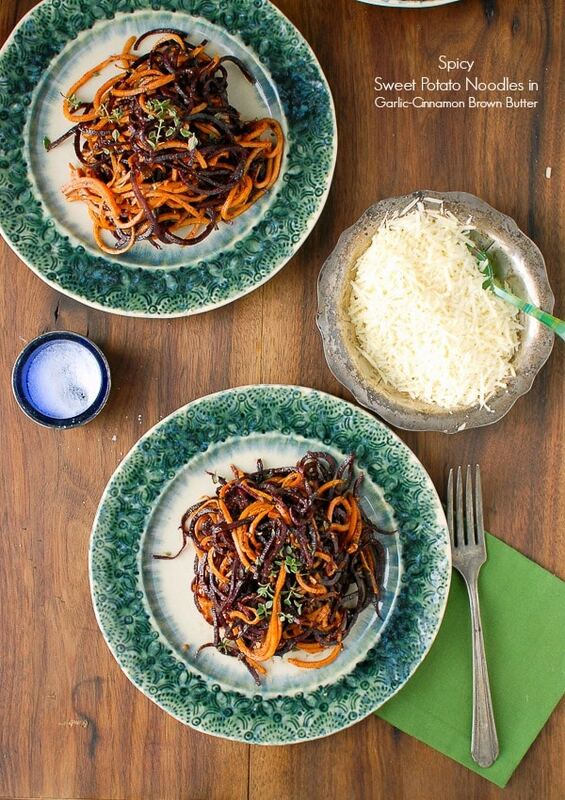 Who needs pasta when you can make your own Spicy Sweet Potato Noodles in Garlic-Cinnamon Brown Butter? Easy and delish. I can say without a doubt one of the favorite additions to my kitchen this year is my Spiralizer. I originally purchased it out of sheer intrigue. I loved the idea it could turn ordinary produce into ribbons of faux pasta or nests of tangled deliciousness. I always love an open ended proposition and the chance to step out of the box. In my mind the Spiralizer offers an invitation to experiment and see what I could create from vegetables and fruit. A few favorite creations so far are Butternut Squash Noodles with Sage Brown Butter, Zucchini Ribbon Mediterranean Salad and Cucumber Melon Spa Salad (this Freaky Halloween Salad was pretty fun too). I also love the idea of making vegetable pasta out of vegetables, not pasta flavored with vegetables and colored like them. It’s naturally gluten-free which is fantastic. The speed with which vegetable pasta can be made fits well into my speed meal needs on busy school nights or when I’m feeling lazy. Vegetables are turned into noodles in minutes, and by roasting squash noodles (or sweet potato in this case) for less than ten minutes the texture is that of traditional pasta. Winter squashes are perfect for this and when complimented by the right topping or sauce truly can be mistaken for flour pasta. While I’m sounding like an infomercial I’ll add were you have told me I’d be happily turning squash into pasta I would have laughed, especially that I’d be gobbling it up faster than my family could get a share. 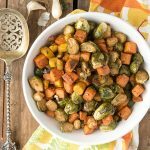 I love the texture, the full flavor when roasted, the nutritional content and the lower calories. 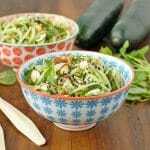 At this time of year the Spiralizer is a fabulous tool to keep meals fast and healthy. There are loads of options to try that provide a great result with good structure. It was feeling like a Spiralizer opportunity recently between the parade of holiday sweets in the Boulder Locavore house. When shopping I snatched up a traditional sweet potato and a purple variety. I truly feel, especially when coaxing younger eaters into trying new things, that novelty is your friend. A wound pile of orange and purple noodles is not something to be easily ignored! After roasting the noodles I tossed them in a fragrant garlic brown butter with red pepper flakes, cinnamon and nutmeg. 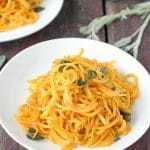 The butter is intense in flavor and spice which is imparted to the sweet potato noodles for a warming, irresistible dish! 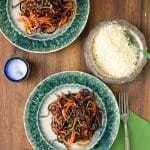 Spiralized Sweet Potato noodles pass for traditional grain pasta with loads more flavor, nutrition and fewer calories. Tossed in a simple garlic, red pepper flake and seasonal spice browned butter makes a richly flavored filling option in less than 30 minutes.Recipe can be doubled or tripled keeping the ingredient proportions the same. 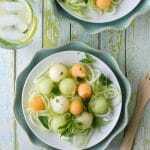 See the Notes section for a link to an Spiralizer alternative. Preheat oven to 400 degrees. Line a baking sheet with parchment paper. Combine the red chile flakes, cinnamon and nutmeg in a small bowl, stir to blend together and set aside. 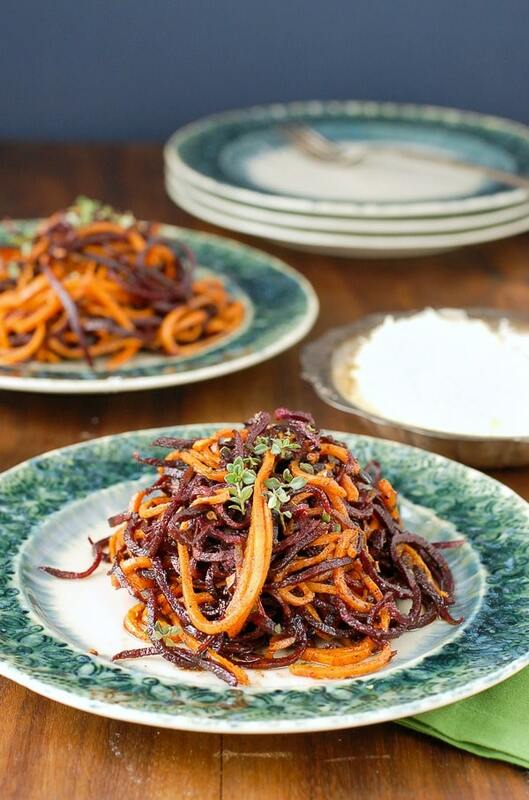 Place spiralized sweet potato noodles in a large mixing bowl. Add the olive oil and toss to coat. 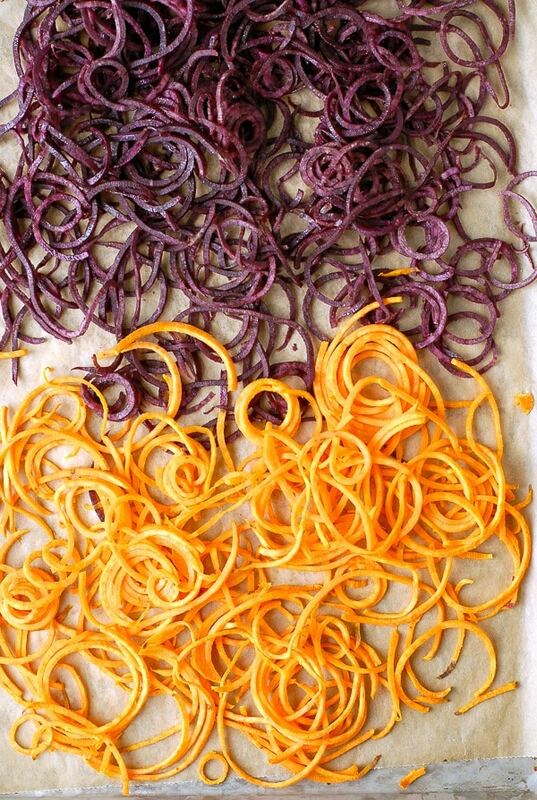 Note: if using both colors of sweet potato, the pigment of purple sweet potatoes may transfer to the orange noodles when raw. To keep both colors intact, I toss them in separate mixing bowls each with 1 teaspoon olive oil. Place on the prepared baking sheet, spreading them to a single layer. Bake noodles for 7 minutes. Remove and set tray aside to cool (sweet potato noodles will continue to soften as they cool). In a large skillet, melt the butter over medium-high heat. When the butter is melted, add the minced garlic and saute for a minute. Add the spices and stir constantly to blend. The butter will darken and brown; stir an additional minute and remove from the heat. Add the sweet potato noodles to the spiced brown butter and toss to fully coat the noodles. Serve immediately. This sounds great for a chilly winter night. Amazing recipe! I made it with coconut oil instead of butter to make it a dairy free dish. My friends loved it. Yay! Isn’t it so good?! You would not imagine something this simple could be so delish. Thanks for letting me know you made it Antonia and about how you changed it up! Thank you Toni and Merry Christmas to you and your family. Dear Santa. Please bring me a Spiralizer. I would love to win this and add to my arsenal of tool gadgets! I would love to win this giveaway and experiment with different vegetables to see which one worked the best with this tool. This is intriguing for a very big salad eater like myself. I would love to win this for my kitchen. This would be good with taters too. I would like to use this on onions and carrots. 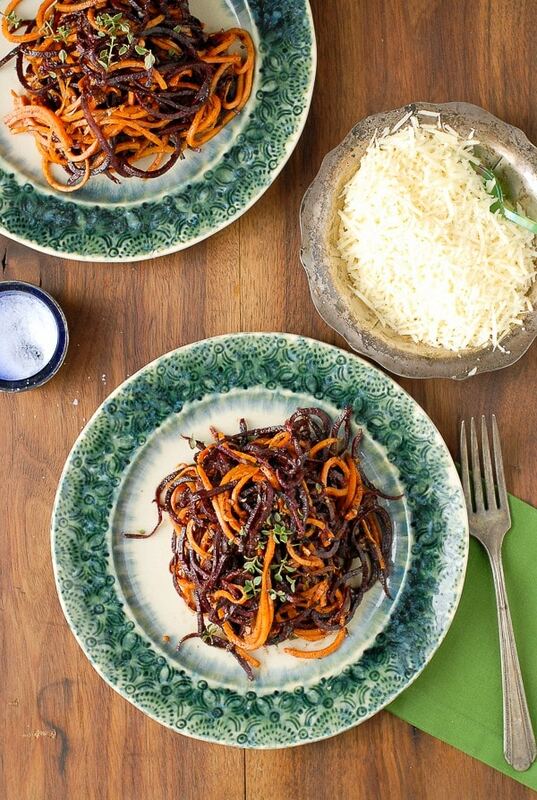 Those sweet potato noodles sound pretty good to spiralize. I would love to use this on carrots. I don’t even like sweet potatoes but I want to try that recipe. Ahh, I’d love this! I’d make so many french fries! The good kind, no more of the ones frozen in the bag. I’d like to spiralize some beets! Great looking noodles, looks delicious! I would love to spiralize carrots, zucchini, sweet potato, and beets!